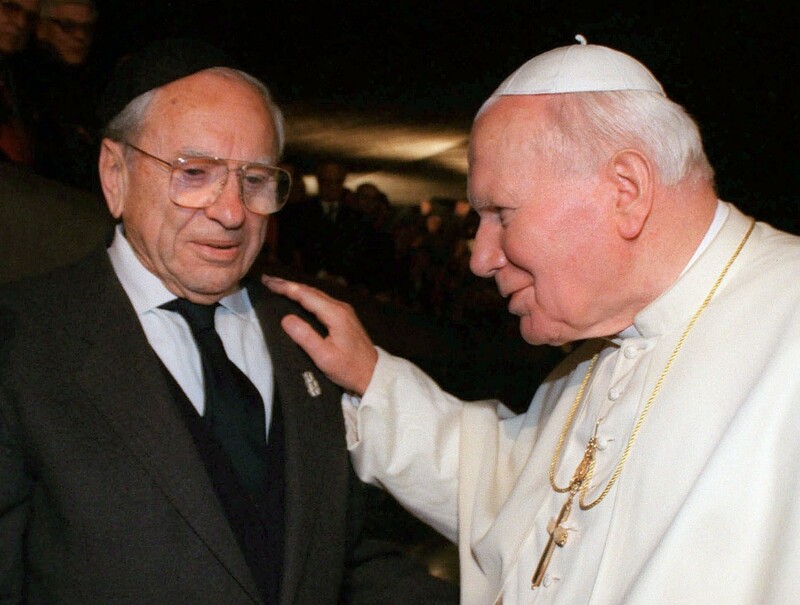 The multimedia exhibit “A Blessing to One Another” retells the story of Saint John Paul II and his relationship with the Jewish community and continues to inspire audiences around the world after its start eleven-year journey. Its narrative began in 2004, when Dr. Yaffa Eliach, a Holocaust survivor and visiting professor of Xavier, proposed the idea to Dr. James Buchanan, Executive Director of The Edward B. Brueggeman Center for Dialogue; Rabbi Abie Ingber, Executive Director of Interfaith Community Engagement; and Dr. William Madges, the chair of Theology at the time, who currently teaches theology at Saint Joseph’s University. “In response to the suggestion, the three of us decided to create an exhibit to inform people about the life-long positive relationship between Karl Wojtyla, the future pope, and the Jewish people, beginning with his childhood in Wadowice, Poland and to encourage people to emulate the example of his friendship with Jerzy Kluger, Wojtyla’s closest Jewish friend,” Madges said in an email. The idea was then presented to Father Michael Graham, S.J. and the Jewish Foundation of Cincinnati, and both contributed funds. This became a historical moment for Xavier and Cincinnati, because it was the first time a Catholic institution and a Jewish organization ever collaborated on an extensive enterprise in Cincinnati. Without the support and financial sponsoring from these partnerships, the “Blessing to One Another” would not have been possible. “I have been a strong proponent of interfaith relations for a very long time, and the exhibit was a wonderful way of telling a story that, beautiful as it is in its own right, also invites people to reflect on what they might do to build bridges of understanding and celebration to people who are different from them in some significant way,” Graham said. In the fall of 2004, Buchanan, Madges and Ingber went to Rome for an audience with Pope John Paul II, where they proposed the plans to open the exhibit on May 18, 2005 for the occasion of his 85th birthday. From then until January, they sketched a rough dioramic design, meaning that it would stimulate the sense of walking into another world. The pressing timeframe called for a rigorous schedule, and the three men typically completed their day jobs before turning to the “Blessing” exhibit. They routinely met around the Bruggeman Center’s dining table at 6 p.m. and worked until the early hours of 3 a.m. Many groups and individuals offered their talents and assistance. Over 20 lending institutions and private donors contributed materials, and some items were lent from Auschwitz, the United States Holocaust Memorial Museum and the Papal Household. Film crews and photographers also generated artifacts by interviewing researchers and historically relevant individuals in the United States, Israel, Poland and Italy. In addition, a Kentucky-based exhibition manufacturing company called Murphy-Catton Inc. turned the designs into a tangible experience. This involved processes such as enlarging postcard images onto panels and building a replica of the Western Wall, where visitors insert prayers for peace and unity. “Somehow, and to this day none of us know how, we opened exactly on time in the Cohen gallery at Xavier,” Buchanan said. The exhibit also traveled to the Pope John Paul II Cultural Center, now called the Saint John Paul II National Shrine, in Washington D.C. Shortly after, it was featured at the Museum of Jewish Heritage in New York City for five months, and from there, “Blessing” was never off the road until 2014. Over a million people experienced the exhibit at 18 different venues throughout the United States, and the final viewings took place at Xavier University and the Hebrew Union College in Cincinnati. “It was the perfect combination of Hebrew-Catholic collaboration, and the perfect ending to the exhibit in the U.S.,” Buchanan said. Madges and Buchanan had been in contact with the Vatican about the possibility of opening the exhibit at the Vatican for the 50th anniversary of the Nostra Aetate, a document from the Second Vatican Council that recognized the existence of multiple paths to salvation and redefined the interfaith dialogue between the Catholic Church and other religions. “It was the moment in 2,000 years when the Jews were told that there can be a relationship between the two religions. It became very, very significant,” said Rabbi Abie Ingber. The Vatican Museum was receptive to the idea, and the exhibit was released to the public on July 28, 2015. The opening press conference was expected to be small, but it ended up having over 200 representatives from six countries. The venue received large audiences and successfully ran until September 17, 2015. It had been a longtime dream to send “Blessing” to Poland according to Buchanan. The three directors, Buchanan, Ingber and Madges, donated the exhibit to the Saint John Paul II Center and Sanctuary, a major developing pilgrimage site in Krakow, Poland. The center accepted the gift and $150,000 to help create space in the museum. Ingber mentioned that the latest hope is to open the exhibit in time for Catholic World Youth Day, scheduled to occur midsummer 2015. If plans follow accordingly, two million young people and Pope Francis will have the opportunity for first looks at the exhibit’s permanent residence in Krakow, Poland. For more information, visit the exhibit’s official website: http://www.blessingexhibit.org. "A Blessing to One Another"